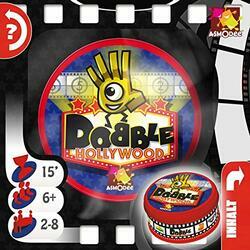 Dobble Hollywood is 57 symbols related to the world of cinema, 55 cards, 8 symbols per card and only one symbol in common between each card. Your objective: to find this symbol before the others! Shark fin, camera, clap, boxing gloves... Discover the 100% movie symbols of Dobble Hollywood! Contents of the box : 55 cards, 1 rule of the game.